As many of you may have seen, on December 28th, 2016, President Obama used the authority assigned to him under the Antiquities Act of 1906 by Congress to declare a Bears Ears National Monument. Now most of the public debate surrounding this area has focused on the wealth of ancient sites, artifacts, rock art, and tribal connections to the area. But the paleontological resources of the area are also highly significant. I had been following with interest and then growing alarm as various advocacy groups began pushing for additional protection for various cultural and scenic resources in the area. State legislators were talking about a public lands "Grand Bargain." Tribal leaders and conservationists were talking about a national monument. No one was talking about the paleontological resources of the area. This was a great concern to me since that has been my field area for several years now and an area I have been involved in and around for well over a decade. Moonrise over Comb Ridge, where my work has focused for the last several years. So I took action. I went down to Bluff in March 2016 to attend Friends of Cedar Mesa's Celebrate Cedar Mesa and agitate. I poked at people; organizers, legislators, BLM administrators, and conservationists. I made a general nuisance of myself and apparently it did some good. Though no Utah state or federal legislators ever got back to me, the folks involved with monument status began communicating about the fossils in the area. It started with simple descriptions of the paleo resources of the area. When I was asked to compile a bibliography of the same, though, that's when I think I opened lots of eyes. The bibliographic list of publications together ran for over 20 pages and left many mineral-geology resources off (as they were being dealt with elsewhere). That is when things accelerated. In April I was brought down to Bluff to talk to folks from FoCM and The Wilderness Society about the importance of the area to paleontology and about the 300 million years of stories in the area, preserved in the rocks of the Bears Ears area. Some of this was eventually made into a video highlighting our personal connections to the area. The video of the personal and deep-time aspects of the area, produced by TWS. Around this time I was also asked to draft language that would protect paleontology in a monument, should the president move forward with a monument. 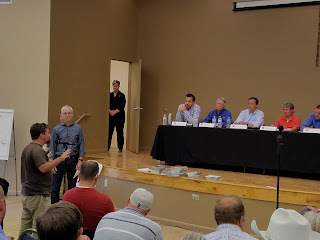 I would have been happy to have provided similar input to the PLI as well, but considering they barred non-San Juan County residents from participating in the Bears Ears portion it isn't surprising that they didn't contact me. A rumor also began circulating that Sally Jewell, the Secretary of the Interior, would be visiting the region over the summer. I sent her a message inviting her to our field camp at Comb Ridge. While the invitation was turned down, I did get a response from her scheduling secretary; encouraging. Over the summer the Secretary's travel plans firmed up and it became clear she would be visiting Bluff in July. I made the three hour trek down there and saw loads and loads of people. The line to get inside the community building in Bluff stretched back on itself multiple times in the heat and the organizers had set up an outside listening area. I patiently waited in line to get a number to speak. Despite arriving at (what I had assumed was) a decent time, I was unable to secure a seat inside. Instead I guzzled water outside with my friend Chris and listened to the first half hour of speakers come and go. The atmosphere was charged but no one was being too terribly rude. I got a text from an inside person and worked my way into the building where the atmosphere was more tense, more dense, but only slightly less hot than outside. View inside the Bluff Community Center. Photo by ReBecca Hunt-Foster. My number wasn't drawn as the day drew near its end but then the Secretary announced that she would be extending the meeting on account of all the people still in attendance. While several people had to leave, including Chris, most of the folks stayed. The Community Center did not seem to empty out, though as people from outside filled in the spaces. As luck/fate/random chance of the draw would have it, my number was called. In fact it was the second-to-last number called to speak. Like the Hamilton song says, I wasn't going to throw away my shot. Many folks had pre-written speeches in hand when they approached the mic but not me. I had an outline in my head and key ideas to touch on; I got up there and spoke based on that. I would like to think my lack of notes in hand and ease with the subject I was discussing helped but I cannot be sure. Speaking to the panel in Bluff. Photo by David Rankin. After probably the most stressful two minutes of my career the meeting was essentially over. I helped pick up the best I could and chatted with folks from FoCM, TWS, the Utah legislature, and various friends before heading to a field camp just up the road. My conscience was clear at this point; I'd made my case to people who would make the decisions. I figured that my work was essentially done at this point. As the summer progressed the Bears Ears radar went quiet for the most part. In September, though, things began to pick back up. I was asked for updated information to provide to the Administration and to speak around Colorado. 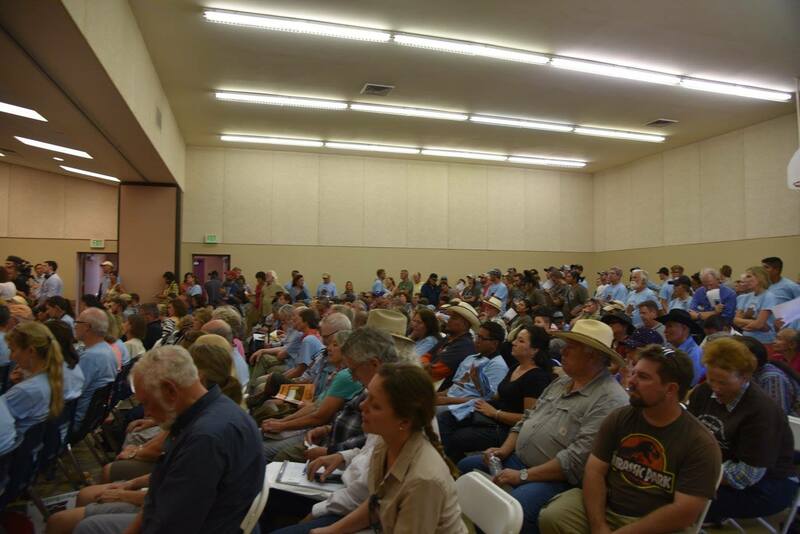 Again, all of this was coming from the monument advocacy side; the PLI crowd still had not been in contact with me, though they had consulted with (and apparently not taken the advice of) other geoscientists who had been active in the Bears Ears area. Also in September the idea was broached to me by Scott of TWS of going to Washington DC and presenting to the White House, the Department of the Interior, and the USDA/Forest Service about paleo in the Bears Ears area. After a fair bit of stop-and-start action, along with an intervening paleontology conference, I ended up visiting DC for the first time ever on Halloween. 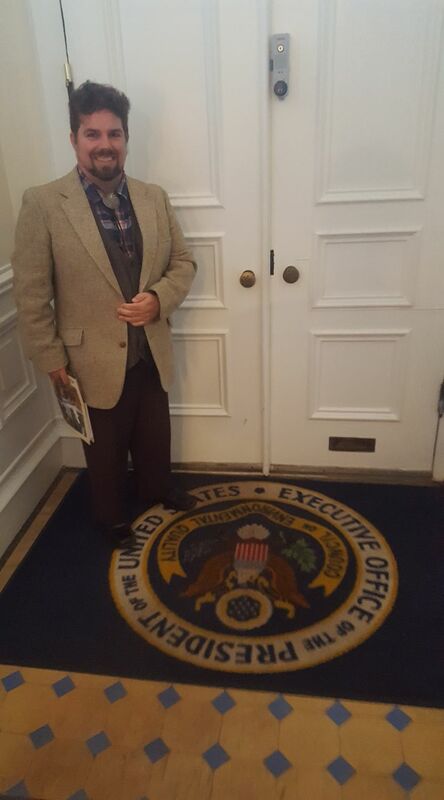 Yours truly standing inside the White House Council on Environmental Quality office. Having never been to DC before this was sort of a double whammy. Here I was, seeing historic buildings, sites, monuments, cemeteries, and departments for the first time but also going into these "Halls of Power" to meet with folks and talk about the land and science that is essentially my consuming passion. People asked if I was nervous going into this part. I wasn't, not really. I know the science, the landscape, the geology, and the region like the back of my hand. In the meetings questions came up about the publication record of certain regions, the relative rarity of certain resources, why certain areas on our map (more on that in a later post) weren't identified as "high potential", and what work was currently happening in the region (along with many others). These are questions I was able to answer but was also happy to be asked; it meant that the people in these departments were taking paleontology seriously and had done their background reading. I left DC knowing that the folks I had talked to were energized about paleontology and hopeful that their enthusiasm and the new information from me would be transformed into paleontology being protected in any future proclamation. Scott from TWS was likewise hopeful. After the election there was some serious concern among folks that despite all the legwork done by experts, advocates, and lawmakers on both sides of the issue that nothing would happen. Despite Rob Bishop et al. 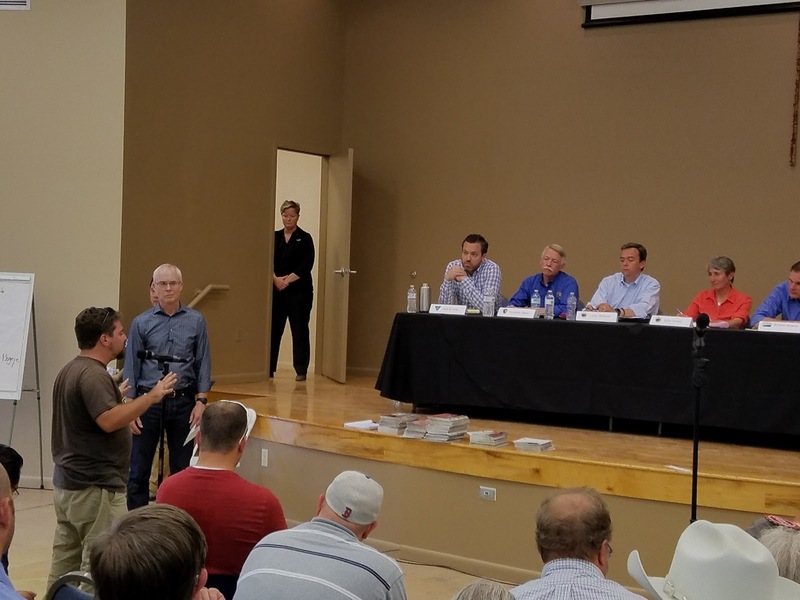 proclaiming that a Bears Ears National Monument would be a midnight monument, that the State of Utah would sue, etc., it was clear at the meeting (and from the amount of work that Bishop put in) that both sides of the issue wanted to see the area protected. There was frantic scrambling to make sure everything was in place should the President decide to act. In the midst of all this chaos some of my colleagues and I managed to put out a preprint on the first vertebrate traces from Comb Ridge, in the Bears Ears area. Everything was poised and ready but no one was really sure it was going to happen until it did. I got a call from an advocate about half an hour before the White House made the announcement; even then I was on pins and needles. Would paleo actually be protected? It is with great relief that I read the proclamation and saw that paleontology was explicitly called out and protected under the proclamation. Perhaps even more surprising (and gratifying) is that a large portion of the paleontology-specific text was mine. I had helped craft this. I had made a difference here. Before I got involved in the process no one on either side of the issue had considered paleontology in the region seriously. No matter what happens going forward we know that paleontology in the region will be protected. By explicitly mentioning it in the proclamation, the president has acknowledged that the resources are significant not only to the area but to the country as a whole. We are continuing our research in the area with two aggressive excavations scheduled for 2017 in the Bears Ears along with continuing high school field camp work, and I am glad that the administration was willing to listen to the concerns of scientists from around the country about this area and the importance of paleontology to understanding its history. Looking forward, this proclamation serves as a framework for future paleontological work in the region. Nearby Grand Staircase-Escalante National Monument has similar language in its proclamation. This language has enabled a flowering of scientific research across the Grand Staircase. Virtually all of the new dinosaur species coming from that area (>95% of them) have been described since the Monument was declared and the wording of the proclamation has allowed that to happen. Horned dinosaurs, duck-billed dinosaurs, and young relatives of Tyrannosaurus rex have all been named in the last two decades. Hopefully, with paleontology being singled out and protected in Bears Ears National Monument, a similar explosion in our knowledge of the past will occur here. There is still work to be done. The fossil-rich areas in and around Red Canyon, currently being worked by colleagues from the Museum of Moab and Appalachian State University, were excluded from the Monument. Of course, with the new administration coming in there are other questions about funding for this and other public lands. We have our work cut out for us. I am mostly happy but I am not content and complacent. More blogs will be forthcoming on this topic too - both about Bears Ears paleo and the process of making a monument. I would like to extend my tremendous thanks to all of my friends and colleagues. Field crews from SGDS and NHMU, under Andrew Milner and Randy Irmis were vital to me getting started in paleo in the Bears Ears, as was a GeoCorps internship with the BLM's Canyon Country District in 2013. Canyonlands Natural History Association, the Museum of Northern Arizona, and the Museums of Western Colorado have also directly made my work in this area possible. Conservationists Josh Ewing, Amanda Podmore, and Scott Miller listened when I started poking things with a sharp stick and ranting about paleo in the area. Thank you to all the folks who listened to me at the meeting in July in Bluff as well as in the offices of DC. All my colleagues who signed my letter that I pestered you about; many thanks! It made a difference. Thank you also to Randy, Jeff, and Kenshu for all the hard work getting the SVP to send a letter talking about the importance of paleo, regardless of how (monument vs. NCA) it would be preserved. Special thanks go out to Julie McHugh, Brian Engh, Tara Lepore, May Blueotter, Xavier Jenkins, and all the people who have been part of our Comb Ridge field crews. Many special thanks especially go to Jen McCollough and Abby Landmeier for all their support during this whole process. Now, prepare for more Bears Ears blogs in the coming year! Edited 12/30 to reflect more accurately how Bishop's PLI planning team interacted with other paleontologists. Congratulations, Rob. You made a difference. Introducing your new bartender, Xavier Jenkins! Ceratosaurus Part 1: The history of a predatory horned dinosaur. Prehistoric Pub. Copyright 2015. Picture Window theme. Theme images by andynwt. Powered by Blogger.